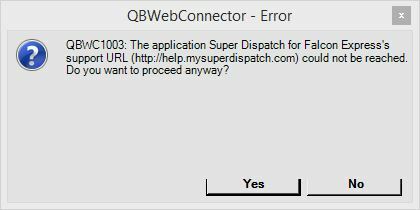 What do you do if you see "QBWC1003: Support URL (http://help.mysuperdispatch.com) could not be reached. Do you want to proceed anyway?" while integrating QB desktop with Super Dispatch? Please don't panic! It's just QuickBooks warning. Just click on the "Yes" button and continue integrating.